Business owners and managers need reports with accurate, timely information that empower them to make decisions with confidence. Some reports are routine and unchanging, but new circumstances may require looking at data in new ways. Standard reports may not encompass the needed information. Here are 5 things to help understand why PBS SQL might be better for your company. A database is where information is stored. A database can be anything from a spreadsheet to an encyclopedia. Why is a software database choice important to a business? The database design will define how data will be stored in it. The more flexible the database design, the more adaptable the system will be to changes in reporting needs, integration with other systems that send or receive data, and more. What is a SQL database and why should I care? SQL stands for Structured Query Language. Older software database designs require special programming skills to access and arrange data in new ways. 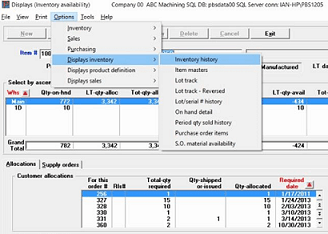 The SQL software database was developed to allow users to select the desired information and then SQL calculates the best way to deliver what has been requested. Users are no longer limited to standard report criteria. For analysis and planning decisions, the more you know, the better the results can be for you and your company. Why care about integrating software? Efficiency and expanded reporting opportunities. Any software your company uses that is SQL-based (has a SQL database) can “talk” to another SQL-based software program. Integration is less costly, less prone to error, and more affordable to maintain. Plus, data from each system can be assembled into single reports to provide a broader, more complete picture of your operation. For more information contact your Partner or Contact Us – We are here to help.